Oh my goodness it's Christmas! Well, very nearly! And we are crazy about Christmas at Ethica HQ. I mean make your own mincemeat and Christmas cake crazy. Well, we haven't made our own Christmas cake this year to be honest but we are still super enthusiastic for all the different kinds of Christmas yum that one can make and find throughout December. For those who like their naughty treats to be as nice a possible, Ombar ticks all the boxes. Not only is it full of characterful cacao flavour, Ombar chocolate is also raw and packed with the naturally occurring nutrients found in the bean. This bar is no cheap corner shop affair and probably won't do for those looking for a sugary, processed, easy fix. It is, however, an excellent chocolate for those who love flavour and intricate notes. Ombar chocolate bars come in a variety of exciting flavours including Lemon & Green Tea, Coconut & Vanilla and Mandarin. We recently discovered Manna BonBons at Poole Vegan Fair and we are hugely happy that we did! This vegan chocolate is like no other in silky melt in your mouth delciousness. And it is now a firm favourite for Christmas gifts among everyone that tried it at Ethica HQ. Each flavour that we sampled was a revelation in purity and paring; La La Lemon was so intense it was almost like eating lemon curd; Storm's cardamom, ginger, sea salt & pink pepper walks a line on the right side of crazy and the smooth vanilla and roasted cashews of Coast is a sophisticated take on the ubiquitous nut bar. You can count the ingredients of each bar on one hand and this natural, unrefined approach allows the character of the chocolate to shine through as well as the chosen accompanying ingredients. These lovely and interesting chocolate bars are new to the UK and while not all of them are vegan the best bars are (according to my vegetarian taste tester) with the Cru Virunga being the all round favourite. The flavour of this particular chocolate bar was pretty special with lots of fruity notes and is the perfect stocking stuffer for any chocolate enthusiast. 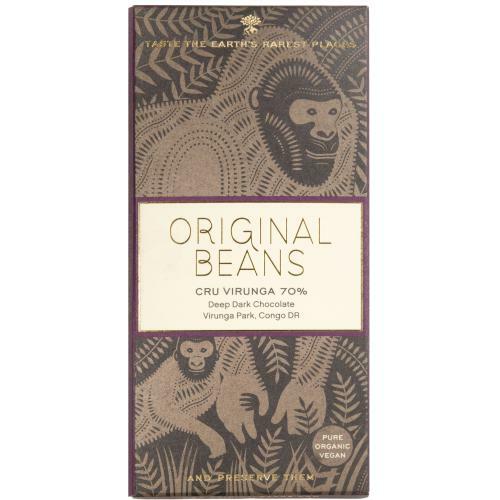 Original Beans is a special company with strong ties to their producers and an adventurous spirit, trawling the forests for singular beans to make remarkable bars of chocolate. They also take their environmental commitments very seriously and have planted millions of trees in an effort not only to offset their impact but to actively enrich the communities and environtments in which they operate. I was never a huge white chocolate fan as a child and maybe that was because I was always a vegan in waiting but I have become a recent convert thanks to Solkiki's Raspberry White Chocolate bar. This has got to be the last word in luxuriant chocolate! The raspberry punches its way through creamy smoothness of the white chocolate and creates a perfect balance of sweet tang as well as giving the bar a soft pink colour. All of Solkiki's bars are made from 100% organic cocoa beans and are made in small batches to preserve the quality and flavour of the ingredients and this considered process really shines through in all of their products. Oh Almighty Foods, how I love you! These guys are great, fun and super conscientious, making their incredible organic chocolates and spreads in a totally vegan establishment in Scotland. Their little cashew based-bars are beautiful to look at and are delightfully rich and flavourful. My personal favourite is the Creamed Coffee & Hemp bar which has got to be one of the most delicious chocolate bars of all time (no hyperbole here). They also make a range of incredible spreads like Hazelnut Fuj which really bring the flavour party to your morning toast.